After releasing two more colourways of the classic lifestyle shoe Jordan V2 Grown this month, Jordan Brand is looking to hit strides once again next month with the release of the heavily-anticipated Jordan V5 Grown Low. 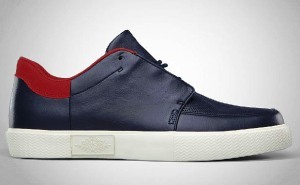 The Chukka-inspired classic lifestyle shoe will debut in March 2011 and it will come out in Obsidian/Obsidian-Varsity Red-SL colourway and based from the images released by the Jordan Brand, the new addition to their lifestyle collection shoes looks really promising! So if you are looking for a pair of sneaker that would suit your lifestyle needs that is made up of durable materials, then the Jordan V5 Grown Low is definitely what you are looking for! Check it out next month and we will keep you updated so visit us regularly!